Bursa cells were separated by density centrifugation and stained with the anti chCXCR4 antibody, clone 9D9 (MCA6012GA) ) followed by Goat anti Mouse IgG:FITC. The dotted line indicates the isotype / negative control. Image courtesy of Sonja Härtle, Institute of Animal Physiology, Munich University. Mouse anti Chicken CD184 / CXCR4 clone 9D9, recognizes the chicken homologue of human CD184, also known as CXCR4 (C-X-C Receptor type 4) and fusin. CXCR4 is a receptor for the chemokine, stromal-derived factor-1 (SDF-1), also known as CXCL12. Research has demonstrated that in chicks CXCR4 is expressed by cardiac neural crest cells and together with SDF-1 is involved with the migration of cells and development of the heart. Where CXCR4 function is lost, cell migration is impaired resulting in cell death and misexpression of SDF-1 leading to cardiovascular defects (Escot et al.. 2013). CXCR4 expression is also linked with other development processes including cerebellar development and with vascularization of the gastrointestinal tract. Clone 9D9 provides a useful antibody for studying development biological processes. 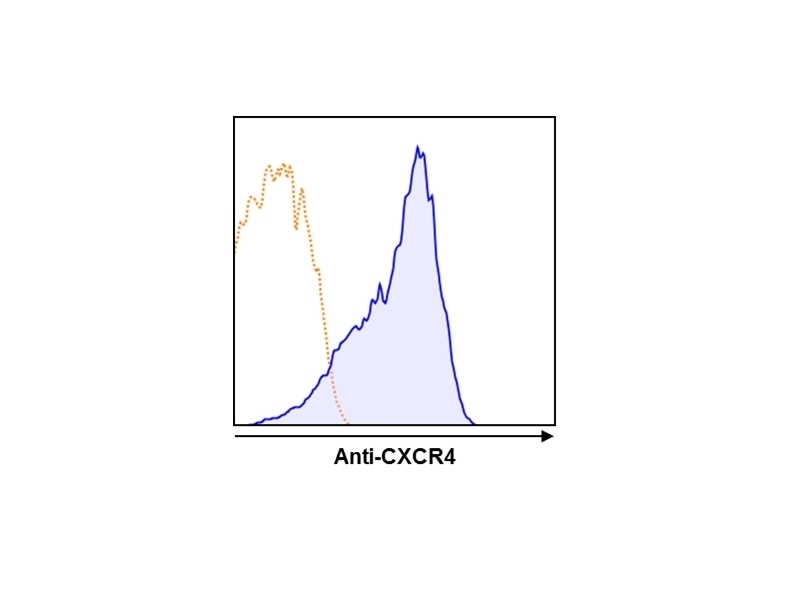 Bursa cells may be used as a positive control for CXCR4 in flow cytometry. Escot, S. et al. (2013) Misregulation of SDF1-CXCR4 signaling impairs early cardiac neural crest cell migration leading to conotruncal defects. Kaiser, P. et al. (2005) A genomic analysis of chicken cytokines and chemokines. J Interferon Cytokine Res. 25: 467-84.